Shihan Pete Pukish, owner and chief instructor of Satori Martial Arts & Healing Center, has been training in the martial arts since 1977 and since 1986 has dedicated himself as a full time Instructor. Shihan Pukish has has promoted over 150 Satori Black Belts and Instructors spanning a 25 year career. January 2007 promoted to sixth degree Black Belt in Jiu Jitsu. June of 2007, promoted to sixth degree Black Belt Shuri Ryu Karate. 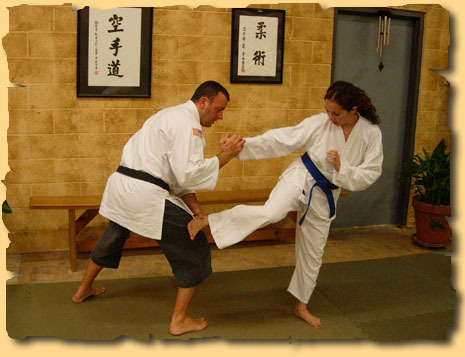 2005 – Voted International Instructor of the Year by the American Budokai International. 2001 – Named State Representative for American Budokai Society, overseeing Karate and Jiu Jitsu in the state of Georgia. Recipient of Distinguished Award from Professor Ramon Lono Ancho. Chief Instructor and the Chief Technical Director for Jiu Jitsu for the American Budokai International (ABI). Founder of Satori Defensive Tactics and Consultants, an organization dedicated to training highly skilled law enforcement agencies such as Police Departments, SWAT Teams, Military Units and large corporations. Founder of Satori International, an organization dedicated to assisting martial artists and martial arts Instructors throughout the world who wish to enhance their skills and art as practitioners and Instructors.